The document original for upload can be in either Microsoft Word or PDF format. 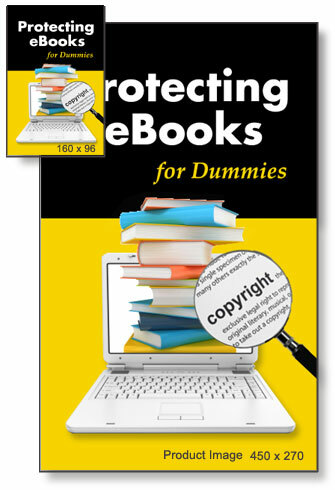 These formats are preferred because they work best when encrypting to .ENC format for use with the CopySafe PDF Reader. No protection should be applied to the original document because when you upload either .DOC, .ENC or .PDF you will have the opportunity to select a variety of protection options that will be very much more effective and more secure than anything available from your document editor. By all means include images where necessary, but please ensure that the type of images used is suitable for this process. If in doubt run a test conversion, and if the images don't look so good when displayed in the CopySafe PDF Reader try using a different image type. BMP and JPG images are most reliable, and any dependence on transparency should be avoided. Always use good quality images so that they won't look pixilated when one enlarges the page to the max. With regard to font selection, the less the better. Times New Roman is usually set as the default font in Microsoft Word for a reason, and that's because it's easily one of the most legible fonts that can be used where there are large bodies of text in paragraphs. By changing a font from that default setting will not impair legibility but it may also affect the spacing between letters. The overall appearance of your publication very much depends on what language and fonts are available on the end user's computer, so the best plan of action is KISS (keep it simple stupid). The artwork required for your book cover can be a single image of minimum size of 470 pixels high x 270 pixels wide. The image file that you upload needs to be of GIF, JPG or PNG format. Do not upload any other file format because your upload will be automatically converted and resized for use as a thumbnail, product image and full size image by the server. Please keep in mind that the first image that a site visitor will see is the thumbnail (160x 96 pixels) so your cover design must look good at this size. Most computers these days use monitors capable of displaying 96 DPI (pixels per inch) so the resolution of your artwork image must be at least 96 DPI, but don't worry if it's as high as 300 DPI because the server will automatically optimize your image for you. The cover image needs to portray what your publication is about and it's title needs to be clearly read, nothing fancy. Photos can be taken by digital cameras but if you want a professional look, have a look at what's available from the many online photo-stock web sites, which provide thousands of images to choose from, taken by professionals and for use royalty free. A high quality 400 x 400 pixel image might only cost $2. However you may need to start a photo-stock account with a minimum purchase of $10, but don't worry, because you will surely use up that credit on your next book covers. Ok, so you can use web-search and download whatever image you see for free. As an author of publications that you will be presenting as authentic and original works, do you want to be seen as a thief of intellectual property? It's best to steer clear of plagiarism... especially if ever your publications get reviewed, because those people writing reviews will looking for anything to chew on. If you are using an odd image composing program that will not allow you to export an image as GIF, JPG or PNG, then what you can do is make it display as large as possible on your screen and then take a screen shot by pressing the "Printscreen" key on your keyboard. To retrieve the screen shot you can open Paint (standard on all Windows computers) and click on "paste" to place a copy into the image area. Make sure you save the image to disk when done. You can upload that image without any cropping because when you do upload, you will be able to select the area that you want to use and crop to size then. If you need help or advise, do not hesitate to use the online support form and ask. ArtistScope is keen to assist all new artists and authors, especially those qualifying for a Sponsored Publication. The author is responsible for procuring and arranging their own merchant card facility. The PayPal service is one well known and well established service that has been around for more than a decade. The PayPal service is available from most countries and transacts in almost as many currencies. To use PayPal for your eBook sales all you have to do is nominate your PayPal username (the email address used for your PayPal account) and you'll be ready for trading as soon as your publication is approved for release by our administrator. For those without a PayPal account, you will find that there is little to no delay in establishing a new merchant account, and it's totally free. All you pay is a transaction fee when you make a sale. Funds paid into PayPal can be transferred to your real account at any time. Which service you choose will depend on factors like volume. Those doing a lot of business can always use a service provided by their bank (available in some countries) for instant payments, while other services may offer smaller transaction fees but only payout at the end of the month. Some users may have restrictions in their own country as to which card service can or can't be used. If another card service is required, simple let us know which one for your account to be customized. If you are stuck and cannot use any of the card services normally available, let us know as we can do the needful, at a premium of course. Note that when you upload and prepare your eBook to be advertised online, you will asked to nominate the price and also the currency. The currency that you nominate should be the currency that is used for the transaction.